SSC CGL 2016 Answer keys – Check SSC CGL (Tier – I) Online Exam Answer key: SSC CGL 2016 Response sheet, correct answer and submission of representations have been released and it is available for download. Are you looking for SSC CGL Tier 1 Online Exam Answer keys? 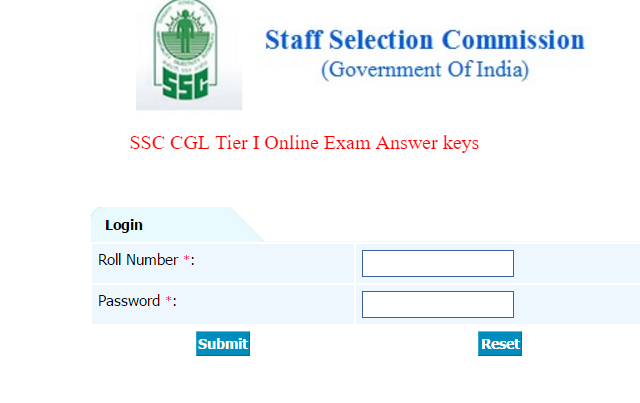 The Staff Selection Commission (SSC) has released official Answer keys (Response Sheet) for its Combined Graduate Level Examination 2016 as SSC CGL exam was online this year. SSC has recently conducted CGL (Tier - I) Online Examination 2016. SSC CGL 2016 Answer keys is available for download. Written Online examination for SSC CGL (Tier - I) was held as it was scheduled from 27th August to 11th September 2016. SSC has released its Graduate Level (CGL) Response sheet and it is now available for download submission of representations on its official website at ssc.nic.in. Aspirants can check official answers of questions they have been asked in SSC CGL online Exam 2016. The Staff Selection Commission (SSC) has conducted Online Examination for recruitment of Group B and Group C posts in various Government Department. This year, SSC CGL Examination 2016 (Tier - I) was held in Computer Based Examination mode from 27th August to 11th September 2016. Aspirant can download their SSC CGL 2016 Answer keys. A very large number of candidates were appeared for this SSC CGL 2016 online examination. Now all of them are very eager to know the correct answer of all the questions of each shift they have been asked in SSC CGL online exam 2016. All those candidates who appeared for SSC CGL Online Examination 2016, they must check SSC CGL Answer key, Response sheet for the same online examination. SSC CGL (Tier 1) Online Examination 2016 response sheet, correct answer and submission of representations is available on its official website which can be checked over there. Date of Online Exam: 27-08-2016 to 11-09-2016. The Combined Graduate Level Examination, 2016 (Tier-I) was held in Computer Based Examination mode from 27 August to 11 September 2016. Representations against the answers, if any, may be submitted online by 5.00 PM on 26.09.2016 on payment of Rs. 100/- per answer. Representations received after 5.00 P.M. on 26.09.2016 will not be entertained under any circumstances. SSC CGL Tier I Expected Cutoff Marks. Now click on ‘CGL 2016 (Tier - I) Exam Answer key’. The next page will come up Link for candidates response sheet, correct answer. Now, Click on Click here link. Enter Roll No. and Password. Candidates are advised to keep visiting this page regularly until they download SSC CGL 2016 Answer Keys, Response Sheet. We have brought SSC CGL 2016 exam answer key as it has been officially released by SSC. Follow the link given below to download SSC Sub Inspector exam Answer key 2016.